The prolonged wet gloom of an autumn heavily influenced by a strong El Nino weather pattern has once again settled itself atop my five acres. As of this writing, in the last three days my yard has received 2.6 inches of rain. Not — praise the heavens — the drenching deluges other regions have received, but enough to turn foliage into mush, dirt into squishy muck, and my enthusiasm into a tiny spark of its former self. 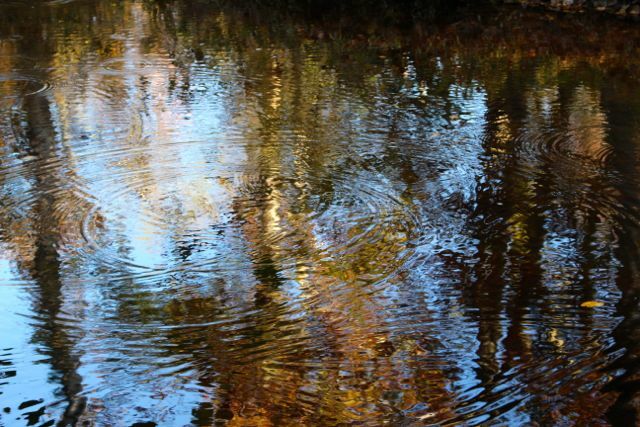 Wet trees dripped circular ripples into the now-filled adjacent creek. That’s why I’m so glad I spent several hours last Friday walking around my yard taking way too many pictures. I knew that if I didn’t grab hold of that blue-sky, sun-filled day, the autumn color on my trees and shrubs would be gone, and I would be left with nothing but fading leaves on muddy ground. The top of a massive Southern Red Oak. 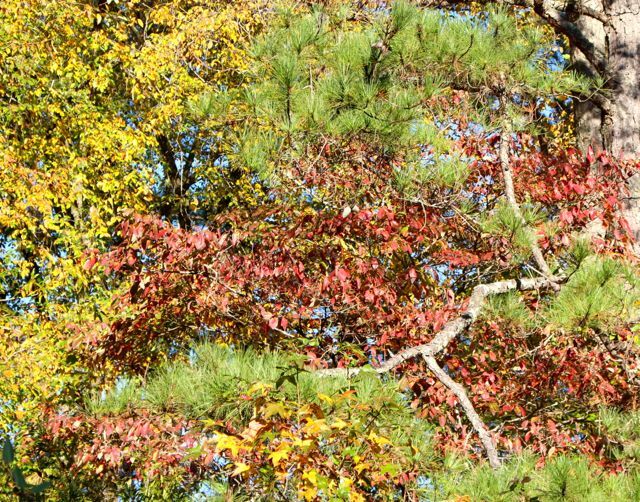 What struck me as I wandered from the top of my hill to the floodplain below was the marvelous colorful tapestry of interwoven canopy and shrub layers. 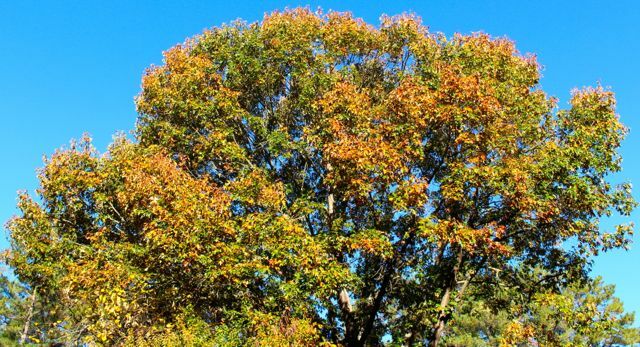 Sweet Gum touched Sycamore, caressed River Birch, tickled Red Maple — all the colors blending together, contrasting with azure skies and kissed by sunlight — the tangled embrace of autumn. 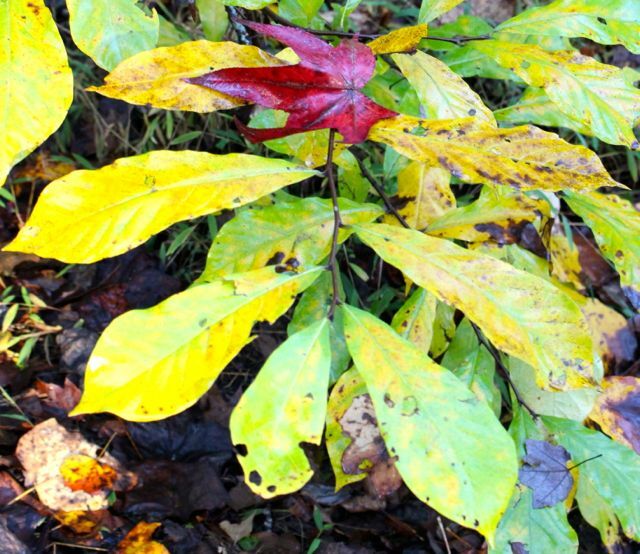 A crimson Sweet Gum leaf rests on a yellowing Pawpaw branch. So on this gloomy day, I want to re-live that recent autumn walk to remind myself of the beauty that was, is, and will be, and to share some of it with those who read this post. 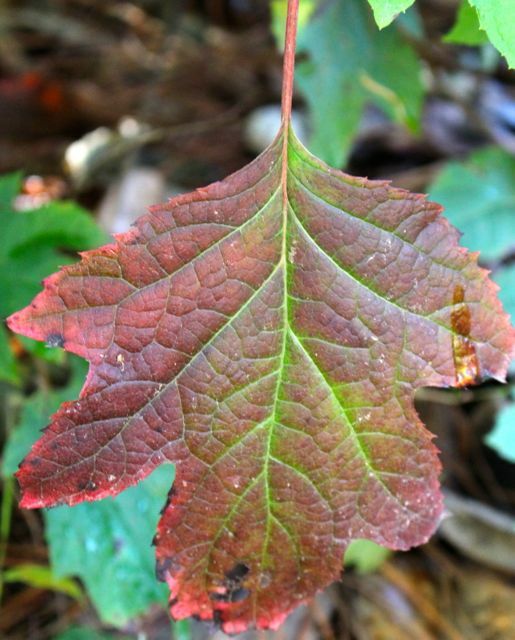 My Oakleaf Hydrangea leaves are just beginning to acquire the deep garnet hues I treasure. I’m trying a new photo format today, so that I can share more photos more compactly. The photo galleries should allow you to click on what you’d like to see more closely while allowing me to organize content more neatly. Please let me know what you think of this display format. Autumn transforms leaves of the many magnolia species I grow into soft golden farewell love notes. The shrub layer was equally lovely last Friday during my walk. When I realized how quickly some of the trees and shrubs were dropping their color, I was very glad I caught them when I did last Friday. Spectacular fall color of Halesia diptera contributes to its year-round seasonal landscape value. The canopy giants that tower 80-100 feet high on and beside our property dominate my landscape. In winter, bare branches draw lines in winter skies, opening my view of the floodplain so that I can see wildlife crossing the creek or hunting for food. Spring fills the canopy with pastel new vegetation, while summer matures leaves into tough green garments that shelter smaller creatures from storms and heat. Autumn transforms the canopy into swirling color and falling fruits, opening my view again so that I can watch Wood Ducks paddling the creek in the sun’s rising light. Bird calls filled the air as I wandered through last Friday’s color. Woodpeckers and warblers chattered constantly about the tasty crimson fruits of the Southern Magnolia dangling from myriad cones. Yellow-bellied Sapsuckers uttered their wheezy, almost cat-like calls as they hitched up and down Tulip Poplars and magnolias. Brown-headed Nuthatches busily squeaked at each other high in the tops of towering Loblolly Pines. Crows cawed at me, annoyed that I was too close to the bird feeders for them to raid them comfortably. 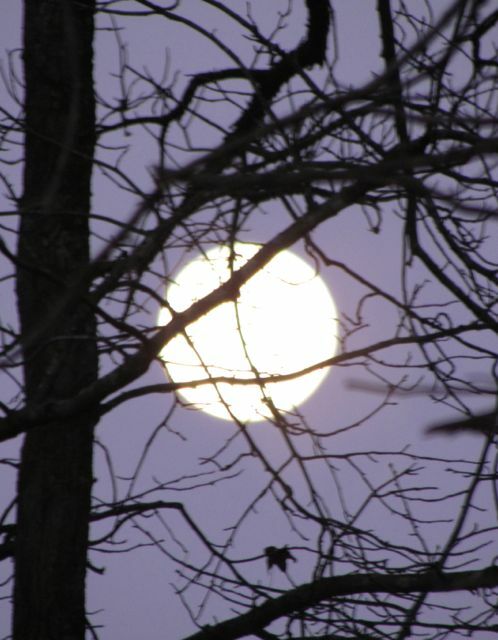 And that night, as I laid in bed admiring a bright moon, the Barred Owls hooted back and forth to each other, so close to my house that their reverberating calls almost rattled the glass in my windows. As much as I miss the green cathedral embrace of the summer canopy and the interwoven tapestry of autumn color, I also welcome the imminent stark landscape of winter. The cold, dark season brings stars closer, allowing moonlight to paint the landscape with bright silver highlights and ebony shadows. Savoring these moments helps me remember that gloomy autumn rains also serve the turning of the seasonal wheel. Any minute now, seed catalogs will begin filling my mailbox. I will happily dream of planting next year’s gardens, rejoicing in the rain replenishing our streams and water tables for next year’s growing season. This entry was posted on November 3, 2015, 12:15 pm and is filed under Favorite Plants, Native Wildlife, piedmont gardening. You can follow any responses to this entry through RSS 2.0. You can skip to the end and leave a response. Pinging is currently not allowed. Great article. All four seasons are lovely! You describe each perfectly. Welcome, Shannon. I’m glad you enjoyed this.